Open invitation: You are cordially invited to the Book Launch Party for Judith Horstman’s Scientific American Brave New Brain at Revolution Wines on Thursday, April 8. Join us as we celebrate this literary force in the community, the power of mind over matter and the spirit of small urban wineries. Who: Judith Horstman is an award-winning journalist whose work has appeared in hundreds of publications worldwide and on the Internet, from USA Today to The Primer on the Rheumatic Diseases to Comstock’s Business Magazine. She has also been a Washington correspondent, a journalism professor, and was the recipient of a Knight Science Journalism Fellowship at MIT and two Fulbright awards in Budapest, Hungary. She is the author of six books, including The Scientific American Day in the Life of Your Brain (2009). 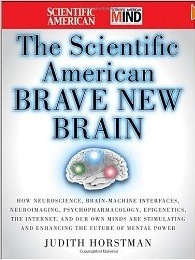 What: We’ll celebrate the publication of Judith’s latest book,The Scientific American Brave New Brain, published by Jossey-Bass this April 2010. Why: Because it’s free with no-host wine tasting, refreshments and everyone will be talking about this book!